Sarah Bean of Arctic Organics sums up what it's like farming in Alaska in August this way: "Yet another week of strange weather, with strong winds testing the sheer strength of the crops. And rain!" That's what happens when the remnants of a typhoon come north. But Bean—and other growers—aren't complaining about some rain. "We're are very happy to have rain, finally," she says. "Enjoying the break from irrigating. This will be the last week we put seeds in the ground for the season, which always feels like a turning point. Now we can focus on making a finite set of crops thrive, instead of a constantly increasing number of them." And the farms keep producing—rain, wind or sunshine! 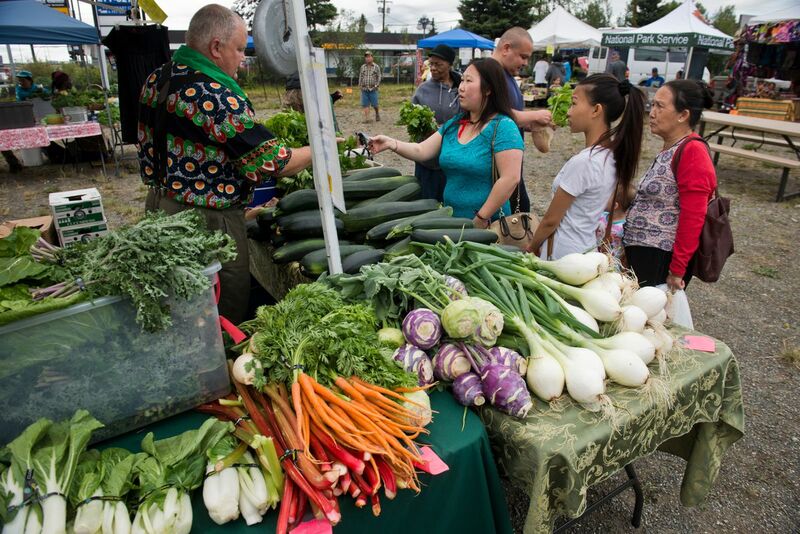 Lesley Dinkel of Dinkel's Veggies says they will have a huge selection of fresh vegetables this week at a variety of markets from Wasilla to Spenard. And she has a suggestion for using the zucchini, broccoli, onions, cauliflower and other veggies. "It's soup season," Dinkel says. "Alaska grown veggies are excellent for soups with the flavor pop they add. The key to good soup texture and flavor is to not overcook the veggies. Work with your herbs, spices, meat and soup base to start, then add lightly steamed or sautéed veggies last." Jerrianne Lowther says the "Muldoon Farmers Market is bursting with crunchy, colorful summer vegetables." And she has a great suggestion of what to do with them: "Eat them raw (carrots, cabbage, sugar snap peas, salad mixes, heirloom tomatoes); cook them gently (beets, turnips, baby bok choy, new potatoes, zucchini), fill up the freezer (onions, broccoli, cauliflower) and enjoy summer crunch all year long!" So, head to the market on Saturday and get your fill. New this week at the Arctic Organics stand are celery, purple top turnips and beet greens—"with baby beets, perhaps," Bean says. The regular summer produce includes fennel, sugar snap peas, cauliflower, radishes, kohlrabi, cabbage, herbs, greens and other items. Other vendors include: Brown Dog Farm, Happy Valley Chickens' eggs, Mom's Garden, Persistent Farmer, Seldovitsch Farm, Shaggy Mane Shroomery, Stockwell Farm, Sun Fire Ridge, Turkey Red Café breads and treats, VanderWeele Farm and Vang Family Garden. Mark Butler says the market is "absolutely stuffed with produce." Among the highlights are squash blossoms and spicy pickled potatoes from Balesca Brother's Farm; Black Bear Farm's flat parsley, celery, king kohlrabi and New Zealand spinach; Chugach Farm with sorrel, huge rainbow chard, ferments and kombucha; Dinkel's Veggies with carrots, potatoes, tomatoes and strawberries; and Four Tern Farm's green beans and sugar peas. The Mountain View market has plenty of veggies this week, including salad mix, beets, carrots, kale, chard, turnips, herbs and radishes. And market manager Khalid Abdulahi says this week the market will have a "Kids Day" with games and candy for children. Barbara Landi says the produce at the market comes in "so many varieties and colors of each kind. More green beans and celery should be on board Saturday, plus more flowers too." Daisy Nicolas of Drool Central has been highlighting Alaska seafood in her dog treats and meals since opening her business. This week, she's expanding the lineup to include Alaska-raised pig and goat treats. And, with all of Nicolas' items, they have creative names. The pig and goat organ meat comes from a Kasilof farmer, and "Oinkwurst" includes Alaska-grown cabbage, while the goat "Ziegeburger" is served raw. Rempel Family Farm will have a huge selection, including carrots, multiple varieties of new potatoes, green beans, tomatoes, sugar snap peas, broccoli, cauliflower, onions and herbs. Arctic Choice will have seafood options, including red king crab, spot shrimp, scallops and ikura. Elderberry Essentials and Farm 779 will be at the Thursday market. Farm 779 is featuring beet kvass and beet kraut, along with triple-fermented oolong kombucha using chaga, peony, ginger and turmeric. Other items include coconut kefir and kefir reductions, fermented vegetables and krauts, body products and raw food meats and treats for dogs. Farm 779 also will be at Saturday's South Anchorage market. Alex Davis will have fresh produce, cuts of pork, eggs, jams and other items at the indoor Center Market. Produce items include orange and icicle carrots, salad mix, kale, kohlrabi, snow peas, red and green romaine lettuce, iceberg lettuce, cabbage, new Yukon gold and German butterball potatoes, zucchini and rhubarb. AD Farm's pork cuts include chops, loin roast, ground pork, sausage and roast.